The Australian Pest Animal Strategy and the Australian Weeds Strategy are vital to Australia’s biosecurity system. Pest animals and weeds have major economic, environmental and social impacts if not managed effectively. The strategies are almost ten years old, and are being revised by the Invasive Plants and Animals Committee to improve consistency with new biosecurity policies; to set national goals and priorities to ensure a consistent approach to the management of pest animals and weeds. The revised drafts are open for public consultation from 5 September to 14 October 2016. Submissions received during this process will be considered when finalising the strategy, due for release in 2017. 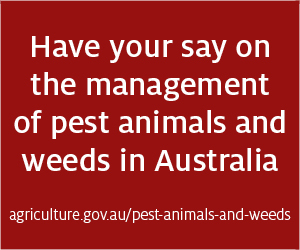 All stakeholder views are important and will help shape the future direction of pest animal and weed management in Australia and IPAC welcomes submissions from all interested parties.